In the 1880s North Mymms had a number of savings clubs, set up by the parish in order to help the poor. 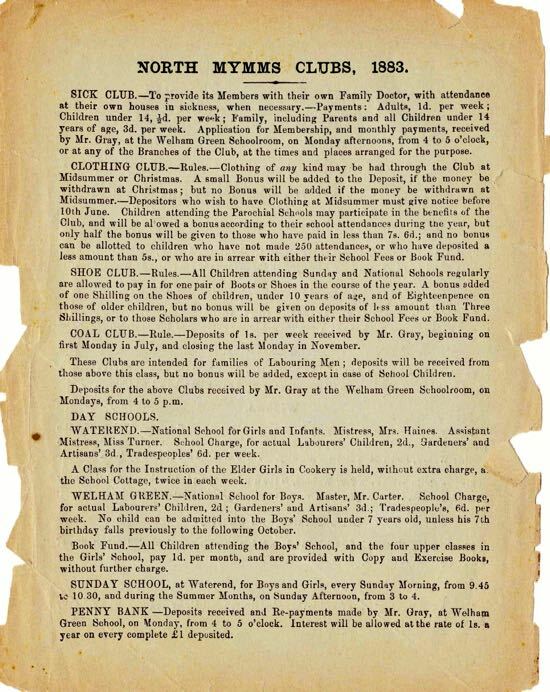 The clubs were funded by regular weekly or monthly payments by both the rich and poor in the parish, and were managed by the church. 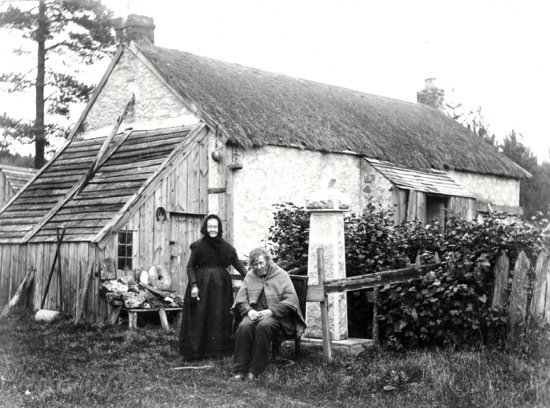 It's estimated that the club which provided clothing for the poor was used by 75% of people living in the parish. North Mymms - "looking after its own poor"
As well as the North Mymms clothing club, there were the coal, shoe, and sick clubs. These were part of the requirement, under the Poor Law, that every parish should "look after its own poor". For one penny a week (there were 12 pennies to a shilling and 20 shillings to the pound) an adult paying into the club on a regular basis could have a family doctor call at their home when sick. For one shilling a week, paid in for 22 weeks from July, a family could have fuel for the winter. 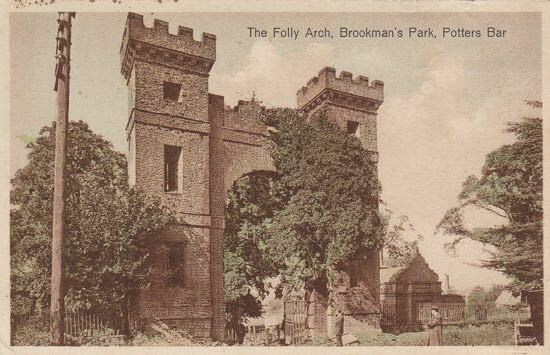 Landowners and other wealthy families, referred to at the time as 'the gentry', also paid money to the clubs as part of the parish's efforts to meet the Poor Law requirements. Image from The Peter Miller Collection. The late Peter Kingsford, in his book North Mymms People In Victorian Times, published on this site, wrote about the clubs in Chapter Seven - Thrift and Philanthropy. Peter wrote that, at the time, both thrift and philanthropy were important "virtues" which "flourished against a background of the Poor Law." Philanthropy, he wrote, was seen as being appropriate for the deserving poor, whereas the Poor Law was for those considered undeserving. "If a man or woman had shown by hard work, thriftiness and abstemiousness in, if not abstention from, drink, that he had tried to be independent, then if he failed, he was a fit subject for charitable help." "Both virtues were encouraged and sustained in North Mymms by the Church of England and in particular by the vicar, his helpers and the gentry under his guidance to whom he set an example in charity." "The greater part of the poverty is self caused"
"The end kept in view of all the Clubs is 'to help those who help themselves'. And while in every parish there must be from time to time a certain number of those who through old age, or sickness, or unavoidable misfortune require positive gifts and alms to be bestowed upon them, reminding us that 'We have the poor always with us' and that 'the poor shall never cease out of the land'; yet it is undoubtedly true that the greater part of the poverty that exists in this country is self caused, and that habits of improvidence and intemperance have generally been the cause of clothing the man in rags and the household in misery. 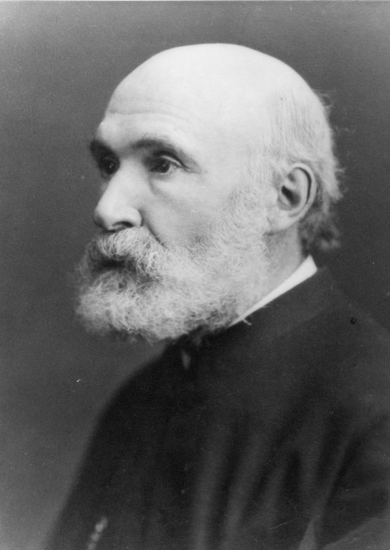 "The Christian man, who wishes really to improve the temporal and eternal condition of his poorer neighbours, will therefore do all in his power to encourage among them habits of thrift and economy, habits of self-reliance and independence; not the self-reliance that makes a man presumptuous and selfish; not the independence that makes a man forget giving honours to whom honour is due; but the self-reliance which makes a man look to his own industry, prudence and forethought, under God's blessing, for providing, not only for his present wants, but also against the rainy day, when sickness, or scarcity of work, or old age, make it impossible for him then to be a bread winner." "How far the situation required encouragement of self-reliance and independence among the villagers it is impossible to say. Such qualities were needed in the hard times when a soup kitchen became necessary. The vicar pointed out that the clubs were meant to be self-supporting but that the gentry could help "without pauperising their poorer neighbours". Moreover, the money, which they would give to the clubs, would be no more than an expression of "goodwill of one class towards another". "In the same issue of the parish magazine he warned his flock not to join the new Agricultural Workers' Union which had formed a branch at Colney Heath. That, he feared, would upset the harmony of masters and men." Clubs for clothing, shoes, and coal lasted, according to Peter Kingsford, into the 20 century. The rent club lasted just a few years in the 1860s. In 1865, according to Peter, the clothing club had 180 members who deposited a total of £64, about 7 shillings each; average wages were 14 shillings a week. Peter concludes the chapter by writing that: "the encouragement of thrift and philanthropy was an essential part of the social cement holding the parish community together up to the 1914-18 war. By that time, however, those virtues had taken other directions." 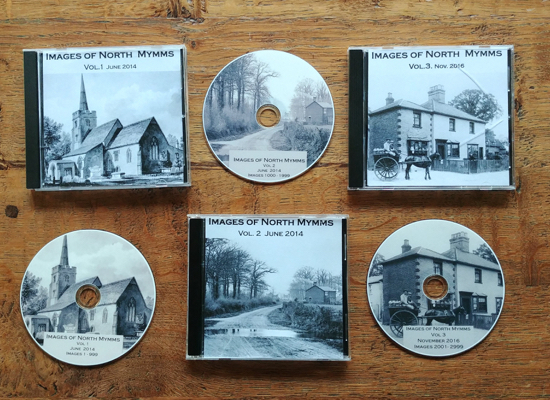 You can read all of Peter Kingsford's book, North Mymms People in Victorian Times, on this site.